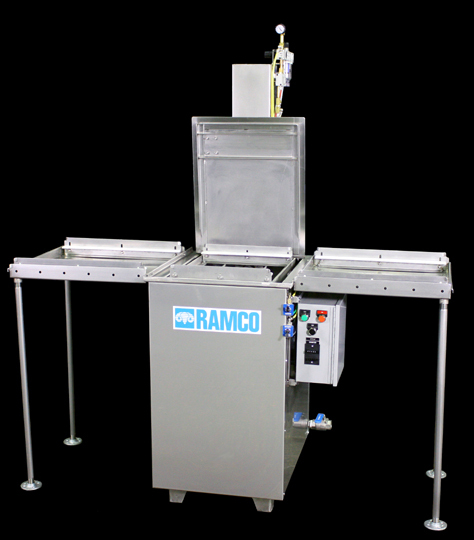 RAMCO has a long history in building solvent compatible all pneumatic immersion washing systems. Because the systems are entirely air powered they are ideal for immersion washing applications using moderate to low flash point solvents. The photo below is a typical small tank (40 gallon capacity) system. 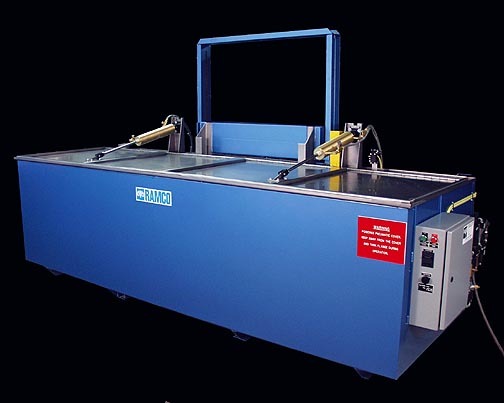 It includes a pneumatic timer/counter/sequencing circuit to provide an automatic washing cycle. The operator loads the platform, presses a start push button. The elevator descends in to solution and the cover closes automatically. The process elevator oscillates for a pre-selected cycle. When the cycle is complete the process elevator rises into a dwell position above the liquid level (please note that this system is built in compliance with a 75% freeboard rule). When the operator presses the dwell release push button the cover opens and the process elevator returns to the original load/unload position. 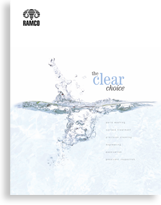 The system also includes an all pneumatic solution turbulation system to further enhance the cleaning action. Another system is shown below. It is a typical large tank system and includes a powered cover with dual lifting cylinders. 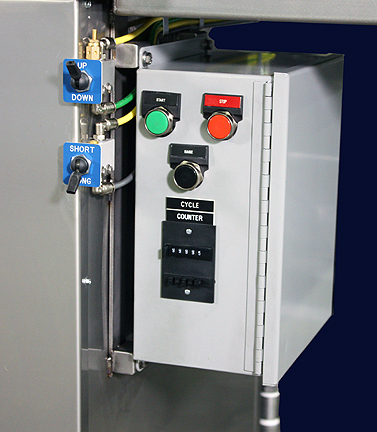 The entire system including the cover and process elevator is powered and controlled using the pneumatic timer/counter/sequencing circuit. This system can handle up to 120″ long loads weighing up to 2000 pounds. The operator loads the process elevator and presses a push button. The process elevator carries the work into the solvent, the cover closes automatically. The elevator oscillates throughout the process cycle. When the cycle is complete the cover opens automatically and the work is lifted to the original loading position. Options include air powered turbos, turbo/filters and parts rotators.